Morning ladies, I'm going for a bit of a classic colour combo today & wearing mainly navy blue with tan accessories. Don't know about where you live but the weather here is pretty grim.....would it be too much to hope that we can have some sunshine & warmth for Bank Holiday weekend?!! Second day of GCSE exams today for our son (bit of a tough week with 4 exams this week) & I've also got my Mum & a lovely family friend popping over for tea & cake. It's been years since we last met so it will be great to have a good catch up. Have a great Tuesday, see you in the morning & don't forget there's 25% off selected items at Boden click here to see what's been reduced! It is freezing over here too Jane, think the boots will be back out for me as well! I did see it is supposed to get warmer for the weekend though:) Four exams is tough going! Enjoy the afternoon tea. Oh no still scarf weather!? I'm disappointed as I can't wear jackets anymore here it is so hot and humid! Let's switch;) Love the boots! Yes let's swap weather Joanna oh to feel the humidity!! I like the look, I like the jacket and I love the scarf, my favorite supplement. It's a pity we can not see more photos, one photo with the post is a bit poor. Gosh Sian you only escaped snow on your run! Surely things have got to start heating up soon?!! It's been pouring cats and dogs here for the past two weeks :( my pool misses me. You look lovely. Could I have those boots? And the weather where you are, love? I'm really loving navy & tan these days, navy is becoming more popular than black in my wardrobe! I seem to go through phases Sarah of reaching for navy & then I'll go back to black & vice versa. Fingers crossed the weather starts heating up soon....I'm sure May always seems quite wet & cold but then things improve in June *touches wood*! 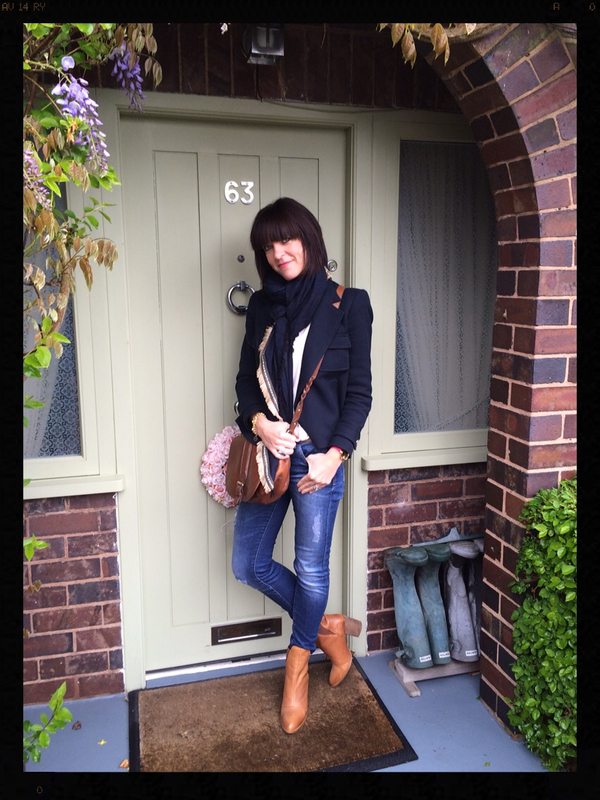 Thanks Lynne, you can't go wrong with navy & denim with tan accessories can you. Thanks Andrea, touch wood he seems to be taking it in his stride......I'm going to be so nervous come results day as he's working so hard I just hope he gets the results he deserves!